Welcome to Ojama week! This week we'll be looking at these cards that never saw use before and probably still never will except for a couple of combos that might actually work. 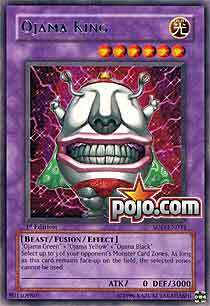 Ojama King is a 0/3000 blocker of a Fusion that prevents your opponent from using 3 of the 5 Monster Card Zones available to them. It's fairly difficult to get rid of a 3,000 DEF monster and launch an assault with monsters alone; impossible if you add Ground Collapse into the equation and your opponent can't use Monsters at all. If Morph wasn't restricted then there might be a case for this guy but otherwise, meh. Coin Flip Ugh. To this week in general… Ugh. Without Scientist or any viable way to play Morph, this thing is a load of crap. I don't care that you can put it in your fusion deck for no penalty (and anyone stupid enough to side deck or main deck the anti-fusion deck cards in Shadow of Infinity will lose 0-2 anyway). My fusion deck consists of six cards nowadays, and I'm considering cutting it down to 3 to save time. Unless you actually want to use Ojama King, don't play him. Ironically enough, he still gets 5/5. Dark Paladin Welcome to a new week of cards, this week we look at some fan picked cards, namely Ojama support, and today we stary with Ojama King, a very nifty fusion. All right, first, admire the fact that this is a monster with 3000 defense. Now that you've done that, be disgusted that Ojama King has 0 atk, but that's fine because you aren't supposed to atk. with him anyway. As long as he's on the field, your opponent can't use three of their monster card zones. Ojama King is nothing short of Amazing. Holding your monster to only two monster zones is fantastic, and not many monsters can break through a 3000 defense wall. Your opponent, more than likely, won't be able to summon anything to break through it without using Lightning Vortex or something. Art: 5/5 How cool is that?